NORTH CENTER — Suzzanne Monk was one of the 2 million Illinois residents who voted for Donald Trump in the 2016 presidential election — and she says that choice is costing her her neighborhood business. In a letter to the editor that appeared Friday in Crain's Chicago Business, Monk, who owns Worlds of Music in North Center with her husband Alexander Duvel, wrote that she has been subjected to steady bullying since the couple's personal politics became public knowledge. "Chicago, you have always been a Democrat-run town, but this year you have become a one-party city terrorizing anyone not in your party for their beliefs.... We will close at the end of April, because we are no longer willing to subject our staff, our customers, our neighbors and ourselves to the daily risk.... We have to leave. In the end, it wasn't the high taxes, constant road construction or high crime. It wasn't the unchecked gang violence or political cronyism. In the end, we have to leave because of the hate you are willing to tolerate.... You have a Trump-sized chip on that big shoulder, and it has turned you into a city of fear, hate and division. A city that encourages political bullying." Trump supporter Suzzanne Monk photographed at an anti-Trump counterprotest. "This is not what democracy looks like ... a world where people are afraid to say they voted for one of two parties," Monk said in an interview. 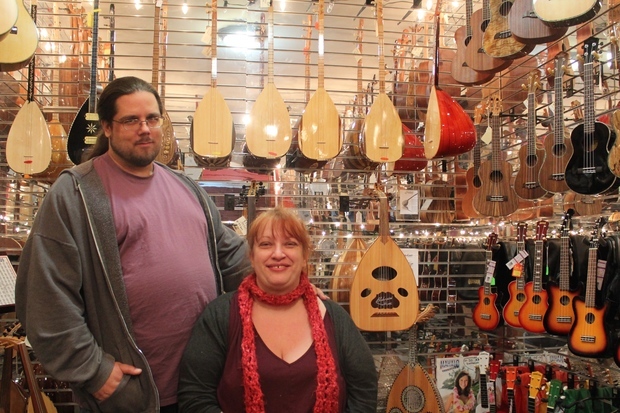 The couple are in the process of shifting Worlds of Music, which sells instruments from around the globe, to an online enterprise because "they can't put a brick through a website," Monk said. 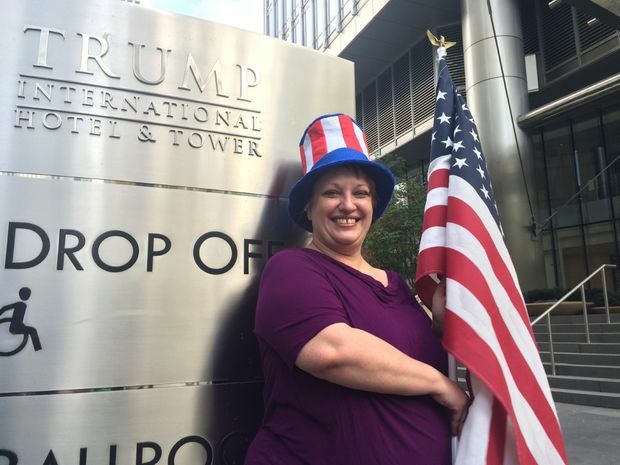 She's set up a GoFundMe seeking $30,000 in donations from "Trump supporters and patriots." The couple similarly launched a GoFundMe in 2015 to raise money to buy out the former Andy's Music Store, which they moved and reopened as Worlds of Music. The pair plan to leave Chicago "as soon as we're physically able," she said. They are closing the shop April 27, she said. Monk said she and Duvel have always worked hard to keep politics separate from their business — for the record, she voted for Al Gore in 2000 and Hillary Clinton in the 2008 primary — but were "outed" as Trump supporters after a debate Duvel had in the comments section of a Facebook post last year during Trump's canceled rally at UIC. The couple began receiving threatening emails along the lines of "We hope nobody fire bombs your business, that would be too bad," Monk said. "The worst of it has been we've had musicians told not to support us or they would be ostracized," she said. Monk says she's reported the anonymous threats to police. Her husband is a lifelong resident, and she's lived in the city for 25 years, but "we no longer feel comfortable here," Monk said. "We'll just start over with a new group of people." What disturbs Monk the most, she said, is that the very people who profess to promote tolerance — progressive liberals — are the same people who have been intimidating her and her husband, or are tacitly approving of the bullying by not condemning it. "It's acceptance of intolerance in the name of tolerance," she said. Where individuals used to be judged by their actions, the "litmus test became Trump and only Trump," Monk said. Though in her mind the election was a choice between a corrupt status quo and change, Monk, who votes as an Independent, said she's been labeled bigoted, sexist and xenophobic for supporting Trump, as if she's been branded with a "scarlet letter 'T.'" "We've had people we've known our whole lives decide we're racist and white supremacist," said Monk. "It's OK to hate the candidate; it's not OK to hate the people who voted," she said. After penning her letter to Crain's, Monk said she was prepared to receive more hate mail but also hopes at least a few people "look at this and say 'that's not OK.'"
"I hope we can get back to civil culture again," said Monk.